While many Kashi products are healthy, they are not all one in the same. Though they're healthy, they're still a processed and not purely "whole grain." Where the Go Lean Crunch is super tasty (not going to lie - it's almost like a healthy kettle popcorn in a bowl,) Cinnamon Harvest is about 10 grams less in sugar, nearly half the calories and made of only 3 recognizable ingredients compared to Go Lean's 15 ingredients with less familiar items, like soy protein. Now the Cinnamon Harvest is nothing more than wheat, cane juice and cinnamon. When all is said and done it's more satisfying and where the first is more calorie dense, the second is more nutrition dense, full of much more satisfying fiber and easier to digest. 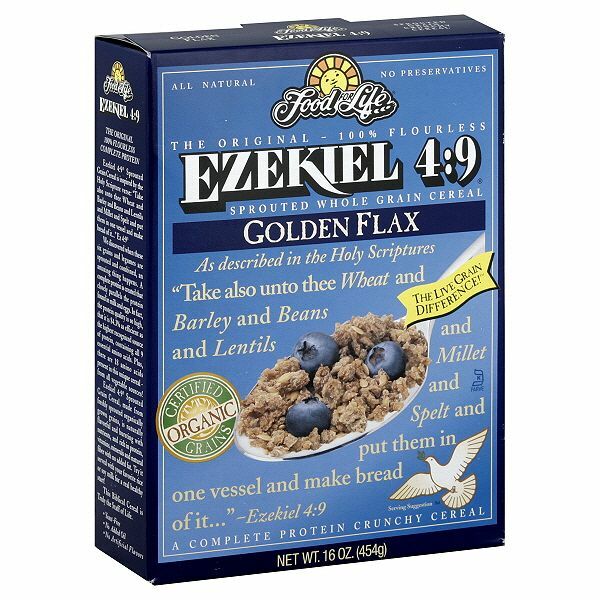 Ezekiel Cereal ingredients: Organic Sprouted Whole Wheat, Organic Malted Barley, Organic Sprouted Whole Millet, Organic Sprouted Whole Barley, Organic Almonds, Organic Sprouted Whole Lentils, Organic Sprouted Whole Soybeans, Organic Sprouted Whole Spelt, Filtered Water, Sea Salt. Ezekiel Cereal has no sugar and can be an acquired taste but once acquired you'll understand how satisfying this cereal can be ( about as much as oatmeal.) Take a look at the ingredients and you'll know you're making a healthy choice when your eating this stuff. “What if what I think is great, really is great, but not as great as something greater.” (Matthew M. – The Wedding Planner) Above is a favorite quote of mine. Sometimes what we think is "great" isn't always the best, and certainly not always "greater" (excuse my english) for us. In America we like to have the greatest of everything. Our culture works hard to have access to the best of everything. And when we discover what we have isn't always the greatest, we feel jipped. Ok, at least I do. More often than not, concerning our food, we over-compensate out of this need to make everything better and bigger. That was just to preface these "Great, But Not as Great as..." posts, where I want to share with you somethings that are "great, but not as great as something... greater." This summer I was asked to teach on healthy eating and cooking. During one class where we talked about snack food options, I encountered a bit of a disagreement over Dannon yogurts with some women who believe it to be very good for you. Good? Maybe. Let's start there: What you think is good, may not be so good. Good - ehh? Yes, it's full of probiotics (fermented foods with active cultures.) But when it's also filled with sucralose (fake sugar,) fructose (sugar,) added gelatin (to keep it jello- like,) and three different dyes for color, my guess is it isn't really "good" per se. Greek yogurt is great for you, full of natural probiotics & calcium. However these flavored yogurts (even the honey-flavored) often contain sugar, honey and corn starch, like the one above. Here we have untainted yogurt. No sugar, no corn starches - pure probiotics and purely delicous. It initially is an aquired taste but paired with the right foods it is really a satisfying breakfast or snack. Plain yogurt is also good for you, just try to stick with organic such as Horizon's, that is free of additives and preservatives. After you eat your dannon sugar free, low-fat yogurt try a bite of Greek yogurt and you'll soon understand what you've been missing. "'Tis the season"... to blow a lot of money on Starbucks holiday drinks. Who can blame you though, when visions of eggnog lattes and peppermint mochas dance in your head when entering the aesthetically appeasing franchise . Starbucks is a place I frequent - holidays or not. And after working there 6 years plus, you'd think one would be sick of coffee, but no. Starbucks effortlessly captures each season within a cup. And as much as I love the Christmas coffee creations every year at Starbucks, my wallet and pant size beg to differ. So after succumbing to my deep appreciation (or addiction) to coffee, I've managed to find healthier beverage choices and at the same time save a buck or two. Here are some worth trying and if you hate it ... just let Starbucks know it's not to your liking. As they do promise - you'll get your drink perfect every time. *All drinks are approximately based upon a grande size and prices may differ. It's official. Starbucks is now serving coffee in their red and loud, festive Christmas cups. The Holiday season is here! No other 2 months of the year seem to go by as quickly as November and December for me. Probably because I get so ridiculously excited for the holidays. As a kid the first week of November meant halloween candy Mom would buy on clearance, eggnog lattes, pumpkin-flavored anything, creamy mushroom soup... the list goes on. But there came a point when I realized I couldn't eat all this every day through November and December (let's not forget New Year's day - because of course our resolutions don't kick in until January 2nd.) Finally reaching an age of self-control and some common sense, I learned how to portion out these indulgences and pace myself through the holidays. While still managing to get a taste of the holidays each day. Cause really... who says you can't enjoy the flavors of the seasons everyday? Well let me indulgde you with this... enjoying your favorite seasonal spices and flavors on a daily basis will help you loose weight. Roasted garlic, chopped chives, simmering thyme and (my personal favorite) the holy trio of cinnamon, nutmeg and ginger are powerfully potent spices that will help you feel more satisfied with each meal and help you loose your unwanted fat. The variety of spices are about as wide as variety of produce. The flavors of this week are thyme and ginger. Thyme helps relieves coughs, bronchitis, and chest congestion. Thyme also has a pronounced effect on the respiratory system; in addition to fighting infections, it dries mucous membranes and relaxes spasms of the bronchial passages. In a large pot, simmer oil, onion and garlic until golden over medium heat ( about 3 minutes.) Add squash and kale and cook until kale is wilted (another 3 minutes); season with salt and pepper. Add broth, beans and thyme. Bring to a simmer and cook until squash and kale are tender, around 12 minutes. Serve soup with salt and pepper and parmesan if desired. And you should! Ginger also relieves colds, upset stomaches, morning sickness as well as reduces reduce heartburn, migraine and menstrual pain. Studies show that ginger also can help reduce the spread of ovarian and colon cancer. Inspired by a recipe by Ina Garten, The Barefoot Contessa. 1. In the bowl of a standing electric mixer, beat the brown sugar, applesauce, and molasses for five minutes at medium speed. Meanwhile sift together the flour, baking soda, spices, and salt. After five minutes add the egg whites. Beat another minute. With the mixer at its lowest speed, add the dry ingredients and mix on medium for one minute more. Stir in the chopped candied ginger. Chill the batter very well. To bake the cookies, preheat the oven to 350F (180C). Line two baking sheets with parchment paper or silicone baking mats. Pour some cinnamon-scented granulated sugar in a shallow baking dish. Scoop the cookies into heaping tablespoon-sized balls (about the size of an unshelled walnut) and roll them in the sugar. Afterward, use your hands to form the dough into sugar-coated balls: don’t be shy with the sugar either. It not only helps to shape the sticky dough, but makes a tasty crust for the cookies. Evenly space the dough on the two baking sheets, leaving room between them to spread. Bake no more than 13 minutes, or until the cookies feel just barely set in the center. Which I find normally at 11 minutes. Remove from oven and cool. If you like a crunchier ginger cookie, these are great with an additional 1/4 cup of olive or coconut oil adding in with the wet ingredients. So it's a win-win. Eat more spices and you'll eat better and live better. Thanks to our guest photographer extraordinaire (and professional calligrapher) - Pam Crosby!